Spa was terrific as usual. The sun shone and we had a great time. The Spa Historic 6 Hours meeting is reckoned to be one of the best in Europe for old car racers. There is a great spread of entries , from pre-war sports cars to my favorites…the big bangers, Lola T70, Porsche 917, Matra, Ferrari…and the circuit is acknowledged to be the best fun to drive on. The 6 hours is on the Saturday night, from 5pm till 11. I have never taken part, preferring to chill out on one of the excellent viewing banks with a crate of cold amber nectar, the light slowly fading and the headlights coming on in the dusk. Re-wind to crack of dawn Thursday, we packed the camping stuff into the car, a Le Mans Allard has huge side-pods and makes an excellent touring car (until it rains!! ), chucked in the tools and spares, and motored down south via the Channel Tunnel. Unfortunately we were held up on the road by a series of jams, which put our timing out, and we hit Brussels at rush-hour… that was when my electric fan switch decided to pack up, and before I knew it, we had boiled. The next service station was down a blocked slip-road, so we soldiered on, only to run out of petrol 1 km before the next stop!! Jonathan manfully pushed the Allard down the gentle slope (so I called it), and was not best pleased when I reminded him it was his turn to fill her up!! That was a mere €145 (ouch!) We also slurped 6 liters of water into the radiator and topped the oil up. On a good run you can do Calais to Spa in three and a half to four hours…this time it was more like six hours. Arriving at the circuit at about 7:30pm, the boys had the steaks on, and we demolished some vin rouge before lights out. Friday is qualifying, and as I pulled out onto the track, there was a terminal misfire and she would only go on full throttle. Sparks or gas…? We coughed and spluttered round to the pits; one full lap of Spa is four and a half miles, pulled in and lifted the bonnet. Nothing had dropped off or was visibly wrong, so we decided to do the mandatory minimum, 3 laps each (Jonathan was double driving) at a crawl, just to get on the grid. Back at the paddock, a carb strip revealed a large chunk of muck blocking an intermediate jet ; a great relief to find a curable fault. I must fit a proper fuel filter. So, we were on the back row of the grid again!! Race day was Saturday and we had got an early (ish) night for once, so felt ready to tackle the awesome Spa bends, dives and climbs. The start is "rolling", and there were 40 cars in our race and we were fortieth. The rule is that although the leaders go over the line and race on the green light, those behind cant overtake till they have crossed the start line. Well, being at the back, its frustrating seeing the leaders roar off round the first bend, I had some right old slow-coaches in front of me. I couldn’t stop the old itchy right foot...so I had five of them before the start line!! Yee-haa!! Fifteen cars dispatched on the first lap....I was having great fun. Then of course it starts to get harder, and by the end of my half-hour stint, I was having a great dice with Adrian Van De Croft in his nimble little Bristol-engined Cooper. We pulled in to change drivers on the same lap, fourteenth at this stage, and Jonathan carried on the "David and Goliath" tussle for his whole half-hour stint. Only this time Goliath triumphed! Our final position, twelfth (third in class). 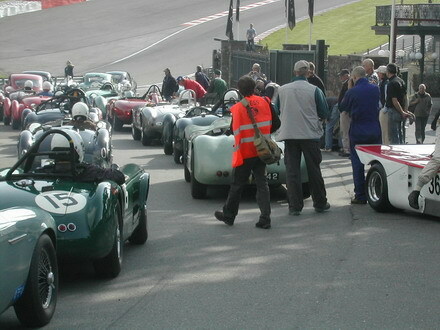 The other Allard in the race was that driven and owned by Chris Phillips, an immaculate dark green J2X. Chris’ co-driver that day was the very rapid Rick Bourne. They finished fifth overall (first in class), behind a Maser 300S, two D-types, and a Lotus X…incredible. We were lapping in three minutes -sixteen seconds, Chris and Rick in three eleven. That equates to an average speed of over eighty miles per hour!! Sadly Malcolm Verey did not finish the race in his black J2. The rest of the day was spent re-hydrating on best Belgian beer, watching the marvelous spectacle that is the 6 hour, and eating more steak and chips! What a terrible life! Roger Murray-Evans and his mate (also Roger) motored down to join us, and declared it was one of the best week-ends he could remember. I say hear-hear to that!